Frozen heart of palm flavor at home? Yes!. Fresh heart of palm flavor at home? Yes. Fresh cut and frozen whole heart of palm. 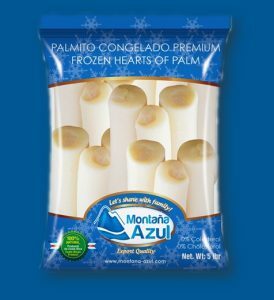 Following the trend of pure tastes, less ingredients in the products and reflecting changing attitudes towards health, community and the environment; we present the “Frozen Hearts of Palm” ” Palmito Congelado Premium”. First quality palms now frozen. The bags of 1 lb – 5 lb full of whole heart of palms, have been requested by consumers from gourmet cuisine all across the world, catering services and food service distributors. Is not a surprise to have fresh heart of palm when visiting the tropical lands of Costa Rica, but it is fantastic to have the same fresh flavor of the palm coming from the freezer. The instructions as with any frozen vegetable is to cook it for 10 min and then use it as desired. There it is, our innovation for the Fancy Food Show in NYC this 2018. 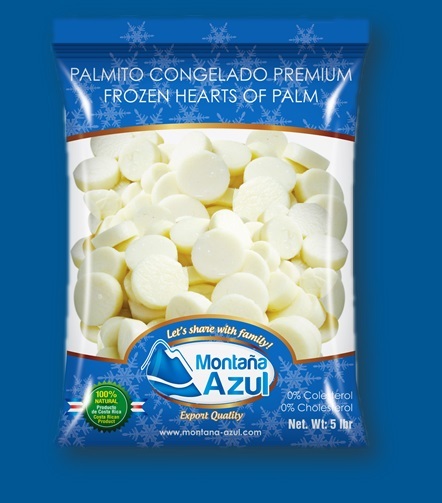 Recipes with the authentic original taste of the palms are now possible, thanks to Montaña Azul.